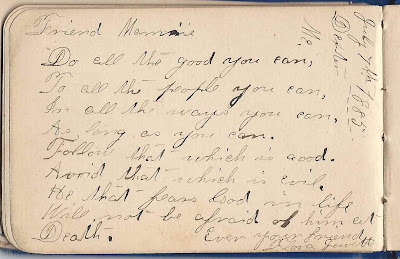 1880s autograph album in which signers from Corinna, Maine, and Dexter, Maine, inscribed pages to Mamie. 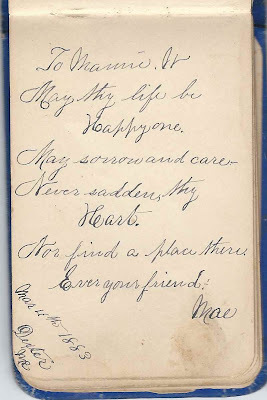 One signer, Mae, added an initial, possibly for Mamie's surname. It looks to be either W. or H. There was a Mamie White, born about 1873, living at Dexter, Maine, but I can't be sure she was the Mamie who owned the album. The album is a small one, approximately 4" x 2-3/4", and contains the sentiments of 17 signers. An alphabetical list of the signers appears at the end of this post. 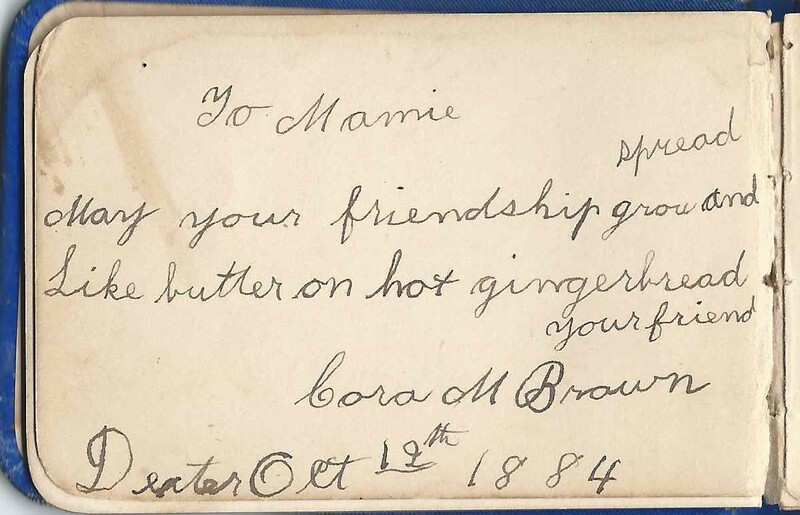 Cora M. Brawn signed a page at Dexter, Maine, on October 12, 1884. 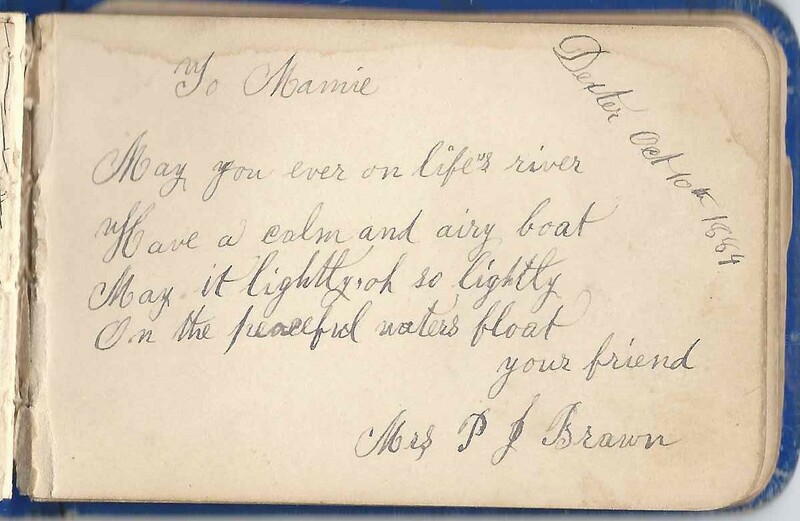 Cora's mother, Mrs. P. J. Brawn, signed a page at Dexter, Maine, on October 10, 1884. She was Pamelia J. (Washburn) Brawn, wife of Benjamin Franklin Brawn, "Frank". 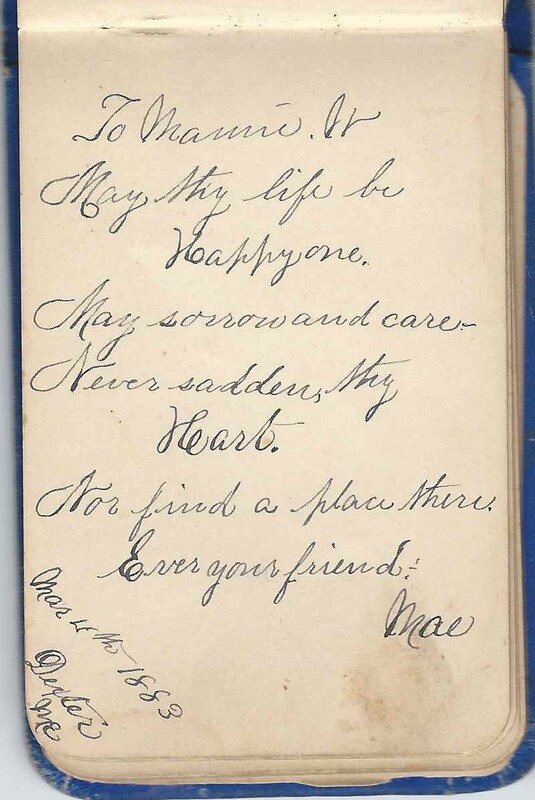 Sisters Flora E. Jewett and Rilla Jewett signed facing pages, but at different times. 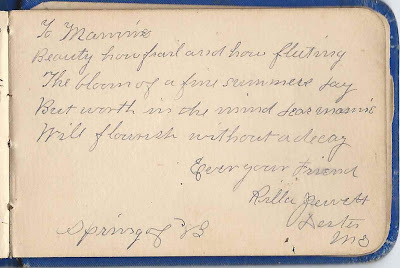 Flora E. Jewett signed her page at Dexter, Maine, on July 7, 1885. 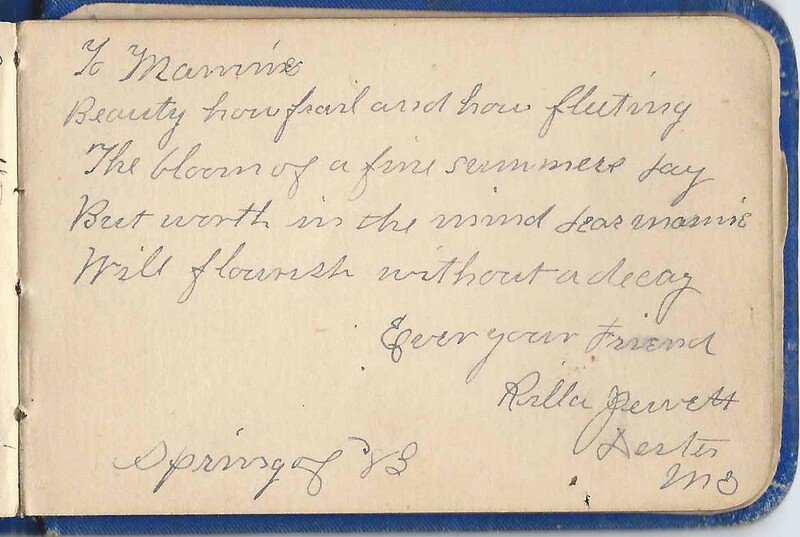 Rilla, who was Marilla P. Jewett, signed her page at Dexter, Maine, in the "Spring of '83". If you have a theory as to the album owner or information on any of the signers listed below, please leave a comment or contact me directly. Thanks! Della L., signed at Corinna, Maine, on February 26, 1883; I believe the initial is L as she wrote an S in a different manner. There was an Adella Libby from Corinna, Maine, born in 1868, sister of signer George S. Libby, and also an Adella Lancaster at Corinna, also born about 1868. 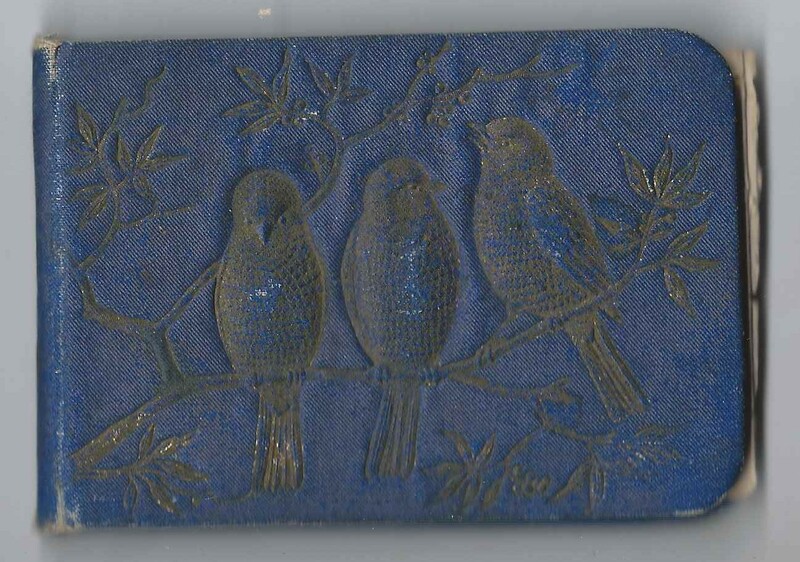 Mae, signed on March 4, 1883 at Dexter, Maine. Mae added an initial to Mamie's name, possibly W or H. There was a Mamie White, born about 1873, daughter of Sullivan and Hannah White, in the 1880 Census of Dexter, Maine. 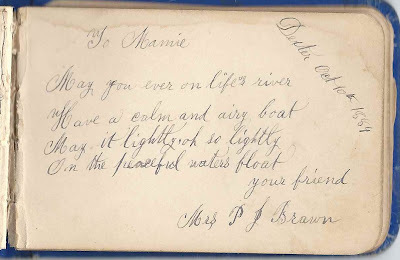 Mrs. P. J. Brawn, signed at Dexter, Maine, on October 10, 1884. Possibly Mrs. Pamelia J. (Washburn) Brawn, wife of Benjamin Franklin Brawn, "Frank" of Dexter, Maine, and mother of signer Cora M. Brawn. 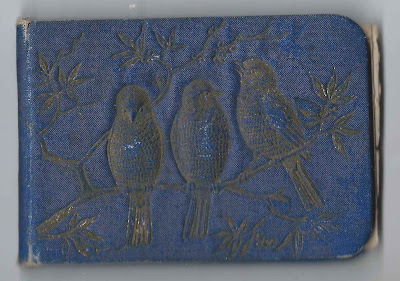 Lizzie Brown, signed at Dexter, Maine, on July 16, 1883. 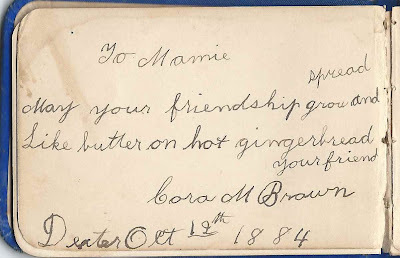 Likely the Lizzie Brown of Dexter, Maine, who was born about 1868, daughter of Leonard and Amanda Brown, as the next page was signed by Mrs. A. M. Brown. Sadly, Lizzie would die on April 12, 1886. Mrs. A. M. Brown, signed at Dexter, Maine, on July 19, 1883, likely Amanda M. Brown, wife of Leonard J. Brown. Lettie Daggett, signed at Dexter, Maine, on October 12, 1884. There was a Lettie Daggett of Dexter, Maine, born about 1859, daughter of Timothy and Mary Daggett, later married William A. Harling of Garland, Maine, on 26 August 1886 at Dexter, Maine. Sister of signer May E. Daggett. Flora Jewett, signed at Dexter, Maine, on July 7, 1885. There is a Flora E. Jewett, born about 1855, daughter of Charles and Jane Jewett, and sister of signer Marilla Jewett, "Rilla", in the 1880 Census of Dexter, Maine. Rilla Jewett, signed at Dexter, Maine, in the "Spring of '83". There is a Marilla P. Jewett, born about 1857, daughter of Charles and Jane Jewett, and sister of signer Flora E. Jewett, in the 1880 Census of Dexter, Maine.